In a large Dutch oven, heat 1/4 cup olive oil over medium-low heat. Add the celery, onion, carrot and parsley. Cook, stirring occasionally, until onions are translucent and vegetables are soft, about 15 minutes. Transfer vegetable mixture to a bowl. Set aside. Wipe out the pan with a paper towel then add 2 tablespoons olive oil to the pan. Heat oil over medium heat. Add pancetta; cook, stirring often, until pancetta is golden brown, 5-10 minutes. Using a slotted spoon, transfer pancetta to a plate, reserving drippings in the pan. Set aside. Sprinkle chicken all over with salt and pepper. Working in batches if needed, add garlic and chicken, skin side down, to the pan. Increase heat to medium-high. Cook until chicken is golden brown on both sides, about 6 minutes. Remove from heat. Transfer chicken thighs to a plate. If the garlic starts to get too brown while the chicken is browning, remove them from the pan with tongs and set them aside in a small bowl. Keep the garlic and 2 tablespoons of drippings in the pan and discard the remaining drippings. Heat drippings over medium heat then add wine and vegetable mixture. Simmer mixture, stirring and scraping up browned bits, until most of the wine has evaporated, about 3 minutes. 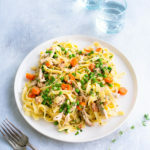 Return chicken to the pan in a single layer. Add stock, ensuring chicken is not completely covered. Return mixture to a simmer. Add scallions, rosemary sprigs, thyme sprigs, and bay leaf to the pan. Reduce heat to medium-low; cover and cook until chicken is tender, 45 minutes to 1 hour. Remove pan from heat. Transfer chicken to a cutting board. Let the sauce sit for 10 minutes to allow the fat to separate from the sauce. When chicken is cool enough to handle, remove and discard skin and bones from chicken. Shred the chicken meat. Set aside. Remove and discard garlic cloves, scallions, rosemary sprigs, and thyme sprigs from the pan. Skim and discard fat from sauce. Stir cream and half of the reserved pancetta into sauce. Cook sauce over medium-high, stirring occasionally, until sauce has reduced and has slightly thickened, 8 to 12 minutes (see Notes). Stir peas and shredded chicken into sauce; cook until peas are just tender, about 3-4 minutes. Season with salt and pepper to taste. Remove from heat, and cover to keep warm. While sauce simmers, cook pasta according to package directions; drain pasta, reserving 1/2 cup cooking liquid. Add pasta, Parmesan, butter, lemon zest, and remaining pancetta to sauce. Stir to combine, adding splashes of reserved cooking liquid as needed to form a creamy sauce. Sprinkle with chopped parsley and serve. The sauce will curdle slightly especially if you use half and half. However, it will come back together once it is tossed with the pasta and butter. Recipe from Food and Wine, January 2019.